TAG Heuer and McLaren Automotive have teamed up once again to combine their dedication to performance and perfection. 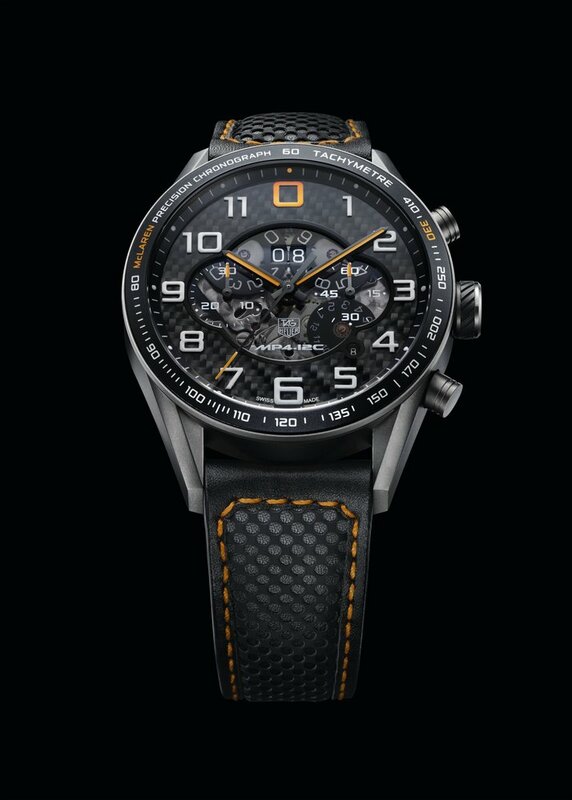 In a partnership that dates back to the 1993 launch of the McLaren F1 road car the collaboration of design and precision engineering has produced another unique timepiece. The TAG Heuer Carrera MP4-12C Chronograph’s exclusive design compliments the MP412C; the first in a range of premium, high-performance sports car produced by McLaren where form and function combine perfectly. Produced in a limited edition of 1000 pieces, the TAG Heuer Carrera MP4-12C Chronograph is available for purchase by fans of the MP4-12C at McLaren showrooms and on www.mclaren.com. Its sensational, sleek design reflects the new sports car in color, materials, and design, with certain technical features debuting on a TAG Heuer chronograph for the very first time. The carbon-based dial draws direct inspiration from the MP4-12C’s carbon fibre chassis – a strong but very light material pioneered by McLaren in race car and road car construction. The sapphire crystal inserts reveal the movement, or “engine”, behind the watch face and, in contrast to the carbon, style an extremely hi-tech watch face. The perforated leather strap’s lining is alcantara, the same material that can be specified for the 12C’s interior. Furthermore, the chronograph casing is durable yet ultra-lightweight sandblasted titanium grade 2, with the McLaren ‘Speed Marque’ logo on the crown. The premium automatic movement – used for the first time in a TAG Heuer model – features a semi-perpetual calendar that needs adjustment only once yearly in February; the Big Date and months indicator displays their progression. Of particular use to pilots and professional drivers, the Flyback Function allows the chronograph to be reset to zero and immediately restarted by pressing the push button, as one of its most performance-driven technical features. Named after the “Carrera Panamericana Mexico Road Race”, Carrera chronographs are legendary since their first launch in 1964, and shape the core DNA of TAG Heuer as leading timekeeper throughout motor racing history. TAG Heuer and McLaren have one of the longest-running partnerships between a brand and a racing team in the history of Formula One. The TAG Heuer Carrera MP4-12C Chronograph commemorates this bond in the pursuit of innovation and driving perfection.